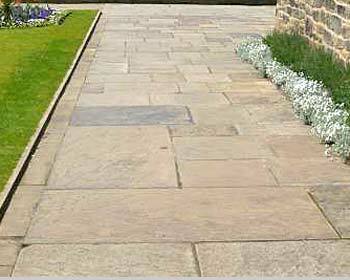 For an authentic period look choose reclaimed yorkstone flags for your patio or pavement. They have a weathered face, a beautiful natural colouring and and wonderful durability. For a really attractive period effect select a mix of sizes and colours. They are ideal outdoors for a cottage garden and indoors to replicate the look of an old farmhouse kitchen. All our reclaimed stone flags are real yorkstone from town centre redevelopments and demolition sites. They are thoroughly cleaned to ensure there are no traces of the the oil and paint that has accumulated over the years. We select only the highest quality reclaimed Yorkstone paving from local authorities and builders across England. How do I order reclaimed paving? 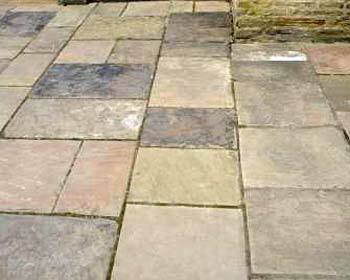 Our reclaimed paving slabs are cleaned of oil and paint, cut square and delivered on pallets to your door. Please contact us for information on sizes and colours. 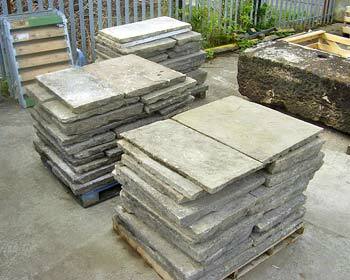 Reclaimed paving stone is from £80.00 per square metre plus delivery & VAT.